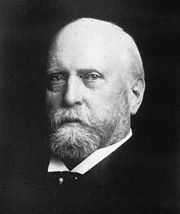 Othniel Charles Marsh (October 29, 1831 - March 18, 1899) was one of the pre-eminent paleontologists of the nineteenth century, who discovered, described, and named many fossils found in the American West. He was the first American professor of vertebrate paleontology. 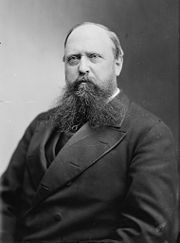 O. C. Marsh is famous for his "paleontological battle," the so-called Bone Wars, with Edward Drinker Cope. The two men were fierce rivals in the discovery of paleontological specimens, discovering and describing over 120 new species of dinosaur between them. Marsh was born in Lockport, New York. He graduated in 1860 from Yale College (which in 1887 became Yale University) and studied geology and mineralogy at the Sheffield Scientific School, New Haven. Afterward, he studied paleontology and anatomy in Berlin, Heidelberg, and Breslau. Marsh returned to the United States in 1866 and was appointed professor of vertebrate paleontology at Yale College. He persuaded his uncle, entrepreneur and philanthropist George Peabody, known as the "father of modern philanthropy," to establish the Peabody Museum of Natural History at Yale. The Peabody Museum of Natural History was founded in 1866 and is famous for its Great Hall of Dinosaurs, which includes specimens found by Marsh, including a juvenile Apatosaurus. Marsh died in 1899 and was interred at the Grove Street Cemetery in New Haven, Connecticut. The Bone Wars (or Fossil Wars) were an infamous period in the history of paleontology when the two pre-eminent paleontologists of the time, Othniel Charles Marsh and Edward Drinker Cope, competed to see who could find the most, and more sensational, new species of dinosaurs and mammals. This competition was marred by bribery, politics, violations of American Indian territories, and virulent personal attacks. The Bone Wars were triggered by the 1858 discovery of the holotype specimen of Hadrosaurus foulkii by William Parker Foulke in the marl pits of Haddonfield, New Jersey. It was the first nearly-complete skeleton of a dinosaur ever found, and sparked great interest in the new field of paleontology. The skeleton was sent to the Academy of Natural Sciences in Philadelphia, where it was named and described in 1858 by Joseph Leidy, who was perhaps the leading paleontologist of the time. E. D. Cope worked for Leidy, and soon was working in the marl pits of southwest New Jersey. Together, they made a number of discoveries, including the second almost-complete skeleton of a dinosaur, a carnivorous Dryptosaurus aquilunguis. They made arrangements for the companies digging up the marl, which was being used as a fertilizer, to contact them whenever any fossilized bones were unearthed. Cope moved to Haddonfield to be near the discoveries, and soon rivaled his mentor in fame. At the time, Marsh was a professor at Yale University (which was still called Yale College), in New Haven, Connecticut, studying fossilized dinosaur tracks in the Connecticut Valley. As the first American professor of vertebrate paleontology, the discoveries in New Jersey were of intense interest. He visited Cope, whom he knew from the University of Berlin, and was given a tour of the discovery sites. Together, they unearthed some new partial skeletons, but the rivalry started soon after, when Cope learned that Marsh had secretly returned and bribed the marl company managers to report any new finds directly to him (Brown and White 1994). The distinctive banding of the Morrison Formation, a group of rock layers that occur throughout Dinosaur National Monument and the source of fossils like those found at the Dinosaur Quarry. In the 1870s, the attention shifted west to the Morrison Formation in Kansas, Nebraska, and Colorado. The Morrison Formation is a distinctive sequence of Late Jurassic sedimentary rock that is found in the western United States and Canada and has been the most fertile source of dinosaur fossils in North America. The Morrison Formation appears to have been on the shore of a great sea during the Cretaceous. The first fossils were discovered by Arthur Lakes in 1877, and that same year, it became the center of the Bone Wars. Since both were wealthy—Cope was the scion of a wealthy Quaker family, and Marsh was the nephew of George Peabody— they used their own personal wealth to fund expeditions each summer, and then spent the winter publishing their discoveries. Small armies of fossil hunters in mule-drawn wagons were soon sending, quite literally, tons of fossils back East. But their discoveries were accompanied by sensational accusations of spying, stealing workers, stealing fossils, and bribery. Among other things Cope repeatedly accused Marsh of stealing fossils, and was so angry that he stole a train full of Marsh's fossils, and had it sent to Philadelphia. Marsh, in turn, was so determined that he stole skulls from American Indian burial platforms and violated treaties by trespassing on their land. He also was so protective of his fossil sites that he even used dynamite on one to prevent it from falling into Cope's hands. They also tried to ruin each other's professional credibility. When Cope made a simple error, and attached the head of an Elasmosaurus to the wrong end of the animal (the tail, instead of the neck), he tried to cover up his mistake. He even went so far as to purchase every copy he could find of the journal it was published in; but Marsh, who pointed out the error in the first place, made sure to publicize the story. Marsh was no more infallible, however. He made a similar error, and put the wrong head on the skeleton of an Apatosaurus (a specimen then known as a Brontosaurus, from another fossil find of Marsh that is now recognized as the same genus as his earlier Apatosaurus find). Marsh had found no skull associated with either Apatosaurus or Brontosaurus and had mounted the head of another sauropod genus (Gould 1991). But his error was not discovered for more than a hundred years. In the 1970s, it was ascertained that the traditional "Brontosaurus" image known to all was, in fact, an Apatosaurus excelsus with a Camarasaurus head incorrectly placed on its body (McIntosh and Berman 1975). In 1981, the Peabody Museum finally acknowledged the mistake, and exhibits around the world had to be redone. Gould noted that this vying for glory between Marsh and Cope fell into a pattern of "rush and superficiality born of their intense competition and mutual dislike." In an effort to "bag as many names as possible," they rushed their publications, often with poor illustrations and inadequate descriptions, sometimes described the same creature twice, gave names to fragmentary materials, and sometimes even described species while the skeleton was still largely underground (Gould 1991). By most standards, Marsh won the Bone Wars. 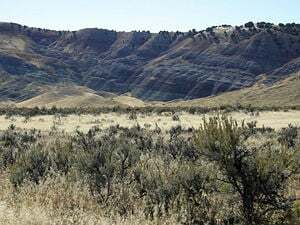 Both made finds of incredible scientific value, but while Marsh discovered a total of 86 new species of dinosaurs, due in part to his discovery of the Como Bluff site, near Medicine Bow, Wyoming (one of the richest source of fossils known), Cope only discovered 56. Many of the fossils Cope unearthed were of species that had already been named, or were of uncertain origin. And while the species Marsh discovered include household names, like the Triceratops, Allosaurus, Diplodocus, and Stegosaurus, even Cope's most famous discoveries, like the Dimetrodon, Camarasaurus, Coelophysis, and Monoclonius were more obscure. But their cumulative finds defined the field of paleontology; at the start of the Bone Wars, there were only nine named species of dinosaur in North America; after the Bone Wars, there were around 150 species. Furthermore, some of their theories—like Marsh's argument that birds are descended from dinosaurs; or "Cope's law," which states that over time species tend to get larger—are still referred to today. Cope is widely regarded as the more brilliant scientist, but more brash and careless. He was so prolific, publishing more than 1,200 scientific papers, that he set a record he still holds to this day. Marsh in turn was colder and more methodical, but he was the better politician. He moved easily among the members of high society, including President Ulysses S. Grant and the Rothschilds. He even befriended Buffalo Bill Cody and the Lakota Indian chief Red Cloud. Their rivalry lasted until Cope's death in 1897, but by that time they had both run out of money. Marsh got Cope's federal funding cut off (including his funding from the U.S. Geological Survey), and Cope had to sell part of his collection. Marsh, in turn, had to mortgage his home, and ask Yale for a salary to live on. Cope nonetheless issued a final challenge at his death; he had his skull donated to science so that his brain could be measured, hoping that his brain would be larger than his adversary. At the time, it was thought brain size was the true measure of intelligence. Marsh never rose to the challenge, but Cope's skull is still preserved (Brown and White 1994). While their collective discoveries helped define the budding new field of study, the race also had some negative effects. Their animosity and public behavior harmed the reputation of American paleontology in Europe for decades. Furthermore, the use of dynamite and sabotage by employees of both men destroyed hundreds of potentially critical fossil remains. It will never be known how much their rivalry has damaged our understanding of life forms in the regions which they worked. Brown, T., and K. White, directors. 1994. The Dinosaurs! : Flesh on the Bones. PBS Home Video. Gould, S. J. 1991. Bully for Brontosaurus. New York: W. W. Norton & Company. ISBN 039330857X. Marsh, O. C. 1877. Notice of new dinosaurian reptiles from the Jurassic formation. American Journal of Science 14: 514-516. March, O. C. 1879. Notice of new Jurassic reptiles. American Journal of Science 18:501-505. McIntosh, J. S., and D. S. Berman. 1975. Description of the palate and lower jaw of the sauropod dinosaur Diplodocus (Reptilia: Saurischia) with remarks on the nature of the skull of Apatosaurus. Journal of Paleontology 49(1): 187-199. History of "Othniel Charles Marsh"